Sunrise Hitek adds a new Duplo DC-746 Cutter/Slitter/Creaser to their finishing offerings. This machine is perfect for mailers that require perforation. Cutting and folding are finishing components within printing that are taken for granted. While it is a given that a job is required to be delivered with the services requested, they do add exponentially to the overall project cost. The Duplo DC-746 Cutter/Slitter/Creaser streamlines these actions. This machine makes folding and cutting not only easier, but quicker to complete. Faster, easier workflow for the printer results in faster, more economically priced jobs for the customer. This cutter offers an impressive amount of features. Not only does it provide automated cutting, slitting, creasing and perfing, but also perfect right angles on small pieces and precise distance from trims to scores, resulting in a perfect piece, every time. Clients can also benefit from multiple “T” and “L” perf configurations already loaded. The Duplo DC-746 is also compatible with the Duplo DC-810 digital UV coating for seamless production. The built-in CCD scanner easily reads barcodes and registration marks. Some projects that are a great fit for this machine are direct mail postcards and mailers. Making a perf can be done while folding and scoring. Clients can use a standard perf or the more complicated L-perf. This machine also micro-perfs which is optimal for pieces that include coupons. Event and raffle tickets are also a great use for perfing. 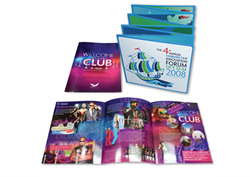 Accordion-folded brochures are a breeze since this creaser can handle up to 20 creases in a single pass. Z-folds, gate-folds, and even the most complicated accordion fold are handled with ease. Even business cards benefit from its ability to cut 24-out in a single pass. In their review of this machine, Printing Impressions stated: “the DC-746 slitter/cutter/creaser is Duplo’s all-in-one digital color finishing solution and is the ideal companion for digital printers with medium to high production jobs.” Sunrise Hitek have been a leader in digital printing for over twenty years and are always looking for the best and brightest in digital print technology. With Up to 10 slits, 25 cuts and 20 creases in a single pass, and micro-perfing, the DC-746 is a finishing workhorse.